For those curious about what sort of person assembles all the junk treasures found in the cyber-museum, the Curator offers this photo. 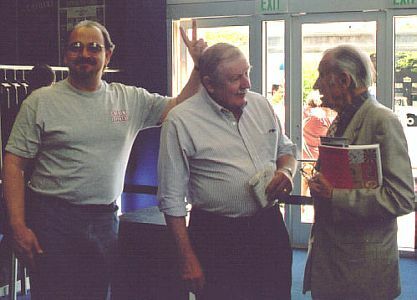 He is seen at left, while John Harvey, (Mr. Cinerama), and SEARCH FOR PARADISE director Otto Lang (now deceased) manage to ignore his presence. We are not kept advised when any film will be released on DVD, Blu-ray, or any other format. We wish we knew why some films are transferred in odd or inappropriate aspect ratios, a problem that is less frequently seen. We don't have much luck finding long lost films. We have no influence, darn it, on how studios, home video companies, or anyone else operate their business. Logan's Run was NOT produced in 70mm Todd-AO, regardless of what the ads or the film credits say, so don't bother writing us about that. Okay, that's enough cop-outs from us. Note, I respond to all emails unless they should get caught in my home-brew spam filter. Museum In-Box. (Note: if you do not receive a reply it is likely that YOUR ISP doesn't like MY ISP. Replies are made via Comcast High Speed Internet Provider.